History was made this weekend as two teams made their athletic debuts. 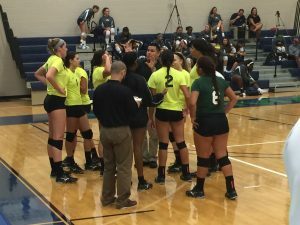 The Women’s volleyball team, under the direction of Carlos Huaroto-Luque played in a tri-match at Ave Maria University on Saturday. 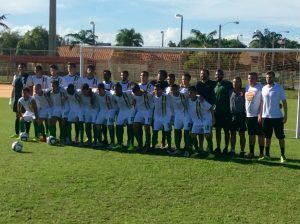 The Men’s soccer team, led by Joao Garcia, got their season started Sunday against Florida Memorial University. In the volleyball game the Lady Conquistadors had a tall task in the first match going against perineal NAIA D1 power, College of Coastal Georgia. The talented and experienced Mariners were too much for the Lady Conquistadors sweeping the match 3-0, 25-12, 25-14, 25-10. Regan Coughlin and Kyra White led the Mariners with 13 kills respectively. Jennifer Johnson chipped in with 6 digs. After a nervous start, the Lady Conquistadors put up a valiant effort by challenging the Mariners on several key points and winning some points. Katherine Vasquez and Brianne Ballow contributed 11 kills, 6 and 5 respectively. Freshman Jazmin Molina made her college debut with 12 digs. “I felt like we were a little nervous to start the game, but we eventually settled down and competed against a very good team”, said Florida National Head Coach, Carlos Huaroto-Luque. In the second match, the Lady Conquistadors faced an upstart Ave Maria team. Depth and a huge front line proved to be too much for the smaller Lady Conquistadors as the Lady Gyrenes handed the Lady Conquistadors their second loss of the season, 3-0 25-15, 25-15, 25-12. Ave Maria served well and Lexy Smith contributed 12 kills. Hannah Wurster added 8 kills. Monique Rivers contributed 18 digs for the Lady Gyrenes. The Lady Conquistadors were led by Brianne Ballow’s 7 kills. Katherine Vasquez and Angelica Mujica had 4 kills apiece. Freshman Jazmin Molina led the team in digs with 6. The Lady Conquistadors will be back in action Aug, 21-23 competing in a tournament in Mt. Vernon Ga against Brewton Parker College, Claflin University and Georgia Northwestern University. It was the dawn of a new era as the Conquistador men’s soccer team outlasted the Lions from Florida Memorial 1-0. In a very physical game that saw several free kicks and a red card, the Conquistadors played suffocating defense to stymie any scoring chance the Lions presented. Carlos Quezada, who was celebrating a birthday, was a brick wall at the goal. He turned back several Florida Memorial shots and frustrated the Lions all game long. The Conquistadors failed to cash in several scoring opportunities early. At the 28 minute mark, Junior Leonardo Rodrigues scored the only goal of the game by racing past a Florida Memorial player on an aggressive move and kicking the ball through the net. “It was a great overall team effort, I was glad to see the fans show up and support us,” said Head Men’s soccer coach Joao Garcia. The Conquistadors will be back in action Wednesday August 19 at 6 pm against Keiser University in West Palm Beach Fl. Meet the first soccer team in FNU history.